Building relationships with your customers by engaging them with an effective customer loyalty program is critical to the long-term success of your restaurant. Ideally, you know your most frequent customers by name; you might even know what they order and – better yet– what to suggest based on what they have ordered in the past. Now, what about the customers you don’t see regularly or the customers who you used to see, but haven’t seen in some time? How do you get them back in the door? The answer lies within your ability to leverage the power of a customer loyalty program and your customer loyalty analytics, both to build a loyal customer base and to bring back lapsed customers. How Do You Define Customer Loyalty In Your Restaurant? Customer loyalty looks different depending on the type of restaurant you have. A deep dive analysis into your customer loyalty analytics data will reveal some important trends about your customers' behavior, and how long it takes for them to transition into loyal customers. How can you measure customer loyalty? Looking at your customer loyalty analytics, find the average number of times a repeat customer will visit your restaurant within a one to three month time frame. We call this your customer loyalty ratio. For a fast-casual restaurant in a high traffic business area, a customer may be considered loyal on the third or fourth visit in 30 days; for fine dining restaurants, a customer may be considered loyal on the guest’s third visit in 60 days. By understanding the customer loyalty ratio for your restaurant, you will be able to understand when you may need to regain a customer based on their lack of engagement during the given timeframe. Once customers are considered loyal, focus on retention. Combine the customer data available within your restaurant POS – another name for your customer loyalty analytics – with an email marketing strategy, and you have a recipe for retention success. Email marketing has maintained its status as the most effective channel for maintaining customer loyalty and increasing revenue; it also remains one of the few digital channels with a clear, trackable ROI. If you aren’t sending follow-up emails to engage with your restaurant customers already, you are missing a valuable piece of the marketing pie. By using your customer loyalty analytics – like those available from Toast – with a smart email marketing strategy, you will increase revenue by increasing the frequency of visits from existing customers and drive additional sales from lapsed customers. What Should I Look For In A Customer Loyalty Solution? There are many types of loyalty programs today; some use an app, some use a third-party website, some integrate directly through your POS, and some still use punch cards. Finding the right loyalty program for your business is about deciding which platform makes the most sense both from a cost perspective and ease of use for customers. In the specific example we are about to explore, the restaurant in question uses the customer loyalty solution offered by Toast. They have tried other customer loyalty programs in the past, but the POS tie-in and the value of the customer loyalty analytics available has made this the most effective option for them. The rich insights you stand to gain from Toast’s customer loyalty analytics will revolutionize your customer retention efforts and grow your bottom line: restaurant-goers who participate in Toast loyalty programs spend, on average, 39% more than non-loyalty guests. Here’s how the platform works: when customers pay their bill, the system asks if they would like to join your restaurant’s customer loyalty program. The program is points-driven and takes very little effort upfront to sign up; it likewise takes very little ongoing effort for the customer to add points to their account and redeem points for rewards in your restaurant. One of the benefits customers will enjoy about participating in a Toast-hosted customer loyalty program is that once they achieve a certain number of points, they receive a dollar amount credit that they can apply to their next restaurant visit. This tactic of transitioning points into redeemable dollar credits will make your restaurant guests visit in again and again. Every time guests on your customer loyalty program visit your restaurant and pay for their meal, either the print, digital, or email receipt produced by the POS will clearly state how many points they obtained from the current visit and how many are needed for the next reward redemption. While these rewards balance receipts are great, the real meat and potatoes needed to drive your CRM strategy is the granular data available from your customer loyalty analytics. The proliferation of robust, loyalty program solutions available today makes it more challenging for restaurants to stand out to customers on their loyalty program alone. Leveraging the insights restaurants have about customers preferences and buying behavior as a result of having a great customer loyalty program is what will set your restaurant apart. Untamed Sandwiches is a 100% sustainably sourced sandwich shop with three locations in New York. They leverage the power of the customer loyalty analytics available through Toast to engage customers. For their first several months in business, they weren’t doing much to promote their loyalty program, named Sandwich Bucks. 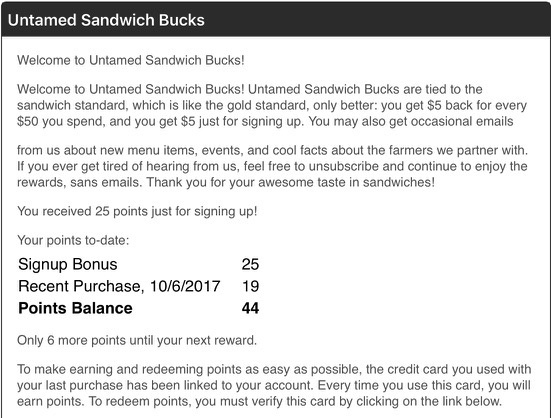 Though they’d email their customers once a quarter about the business and upcoming menu changes, it wasn’t an effective strategy to drive signups to Sandwich Bucks; with no mention of their customer loyalty program in these emails, they had no way to track whether a customer was coming in as a result of their messaging and establish a correlation between their email marketing strategy and repeat visits. In the email marketing space, what they were doing is typically referred to as “batch and blast” email marketing. There have been many enhancements to Untamed’s customer retention email strategy, the most important being that by combining the customer loyalty analytics available in their restaurant POS with consistent, curated email marketing, they are not only getting first-time customers to come back more quickly, they are also getting them closer to the visit that qualifies them as a loyal customer. They also now use the insights available from their customer loyalty analytics to send targeted email campaigns to those who are close to reaching rewards or are close to being considered loyal. Email marketing has also proven to be an effective way to drive signups to Sandwich Bucks by promoting the program to customers who are email subscribers but not yet loyalty members. Untamed found that many lost or lapsed customers come back in for a visit the same day that they receive an email from the team at Untamed; in many cases these people hadn’t visited in more than 30 days. Since they are a fast-casual concept with locations in heavily populated business areas, their goal is to get customers to visit weekly or even more frequently. When they haven’t seen a customer in more than 30 days it is very possible that a customer has lapsed; with so many dining options for lunch in their area, it is very possible that customers liked their food but got focused on other places. After all, over 40% of customers won’t return to a business that satisfied them. **This group was considered churned and probably wouldn’t have been seen again if it wasn’t for the email re-engaging their business. 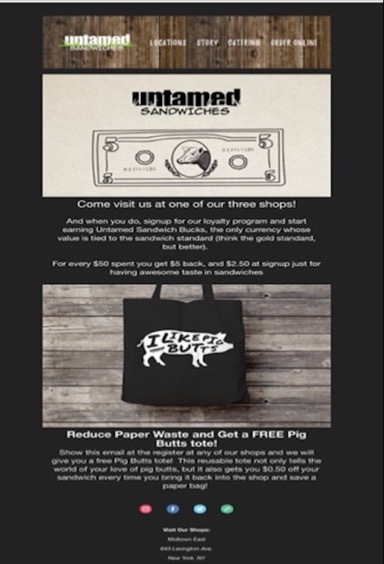 In short, combining data from their customer loyalty analytics with consistent email marketing is driving significant revenue for Untamed; they are able to directly attribute this strategy to customer sales. By using Toast’s loyalty program solution to build their email subscriber list, Untamed Sandwiches has transformed their email marketing channel from an infrequent, inconsistent form of communication to a small unknown group of people, into a powerful marketing tool that enables them to speak directly to a large percentage of verified, paying customers. How Can I Apply Untamed Sandwiches' Strategy In My Restaurant? Create an email signup box or form on your website for visitors. Develop and send a welcome email for everyone who signs up for your email list; promote your customer loyalty program and its benefits. Send emails regularly to your email subscriber list; these emails should include special offers, menu updates, and exclusive promotions just for loyalty program members. Continue to promote (if you haven't started already, get going) your loyalty program in your email marketing. Develop targeted email segments that will target customers who are close to reaching a reward. Thank customers for being loyal! Your customer loyalty analytics should provide information as to how close people are to achieving a reward; it also tells you how often someone visits. Make your best customers feel special by thanking them for their visit. The retail industry does a great job of this with “thank you for your purchase” emails, so borrow that idea! Analyze your email marketing metrics along with your customer loyalty analytics to see how effective your CRM – customer relationship management – strategy is, and then make adjustments. How do you delight your most loyal restaurant customers? Leave your thoughts and suggestions in the comments below!